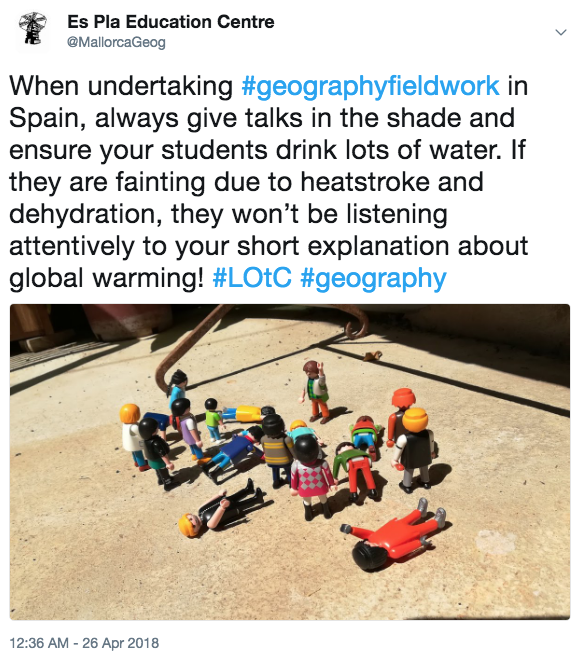 The following is not a guide to geography fieldwork techniques. 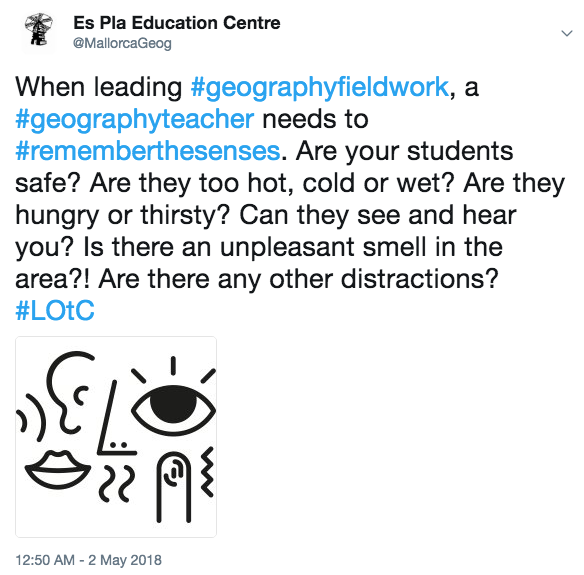 Rather, it is a guide to managing behaviour outside the classroom in order for geography fieldwork to be successfully completed. 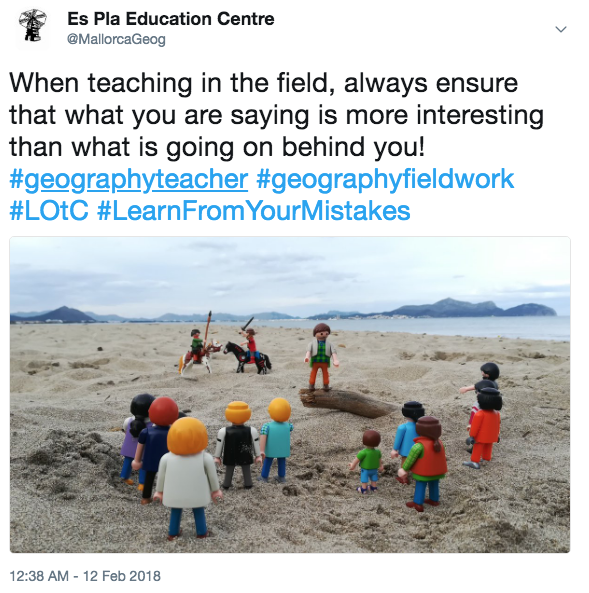 My engagement in geography fieldwork and Learning Outside the Classroom over the past 25 years has informed my approach. When in a classroom, there are hundreds of behaviour management issues to be considered. For experienced teachers, these will have become second nature. However, on stepping outside the classroom, there are a whole range of new issues to consider as well. 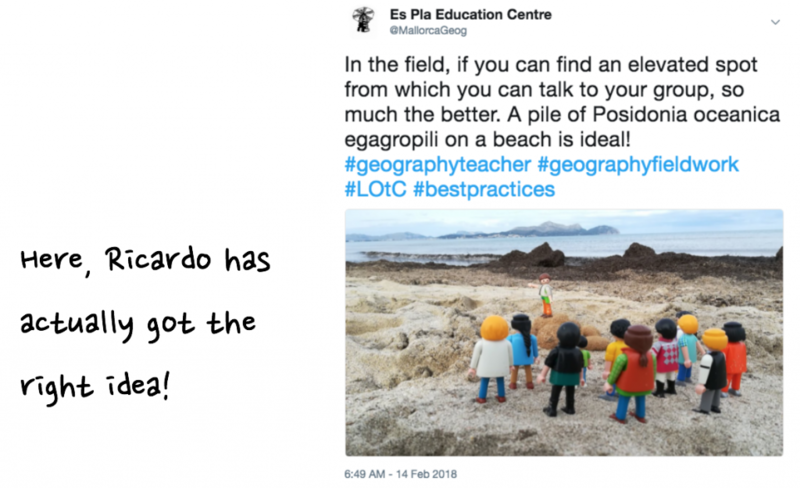 I have witnessed many inspiring and experienced classroom geography teachers become nervous and disconcerted when having to work in an environment that is different to the one to which they are accustomed. Something that is easily remembered works best when it comes to behaviour management techniques. In this case, we need to remember the five senses. These are all connected to our basic needs (physiological and safety) seen in Maslow’s hierarchy of needs pyramid. To illustrate my points, I have enlisted the help of a fieldwork guide – my alter ego Ricardo! He will be featured making all the most common mistakes! All students must be able to see you clearly. This might sound obvious. However, on many occasions, I have witnessed teachers talking to a group of students who can’t see their teacher and, as a result, are not paying attention. 1. If it is a sunny day, ensure that your group are never directly facing the sun. If they are, it will be very difficult for them to see you or the landscape features behind you. 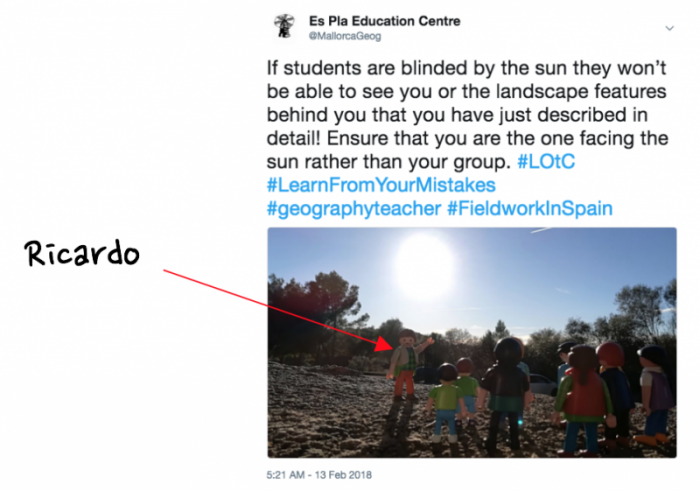 As bright sunshine is not often a problem in the north of Europe, considering the position of the sun is something northern European teachers can forget to consider when they are working in sunnier climes! If possible, position yourself so that the sun is to the side of the group and yourself so that no-one ends up being temporarily blinded. Eye contact is crucial when trying to establish a good relationship with students. Therefore, whenever speaking to a group or an individual, avoid wearing sun glasses. In addition, sun glasses can make a teacher seem aloof or give the impression that they are more concerned with being viewed as ‘cool’. 2. Often, when speaking in a classroom, the teacher will be standing up and the students will be seated. When outside the classroom it is highly likely that everyone will be standing up. Despite being 1.88 cm tall I still use a natural or man-made object to stand on in order for everyone to be able to see me and vice versa. I have used rocks, tree trunks, slopes, steps, benches, walls, ledges and post boxes. 3. Try to ensure that there is nothing more interesting going on behind you or even to the side of you. If there is (be it people, vehicles, wildlife or scenery) this is what your students will be looking at rather than at you. Wherever possible, I try to stand in front of a plain wall. I actually witnessed a colleague giving a very interesting and informative talk on sand dunes that none of the students paid any attention to whatsoever. My colleague was blissfully unaware that going on behind him was a beach swimwear photo shoot! 4.Try to avoid reading from notes as you cannot look at the students at the same time. If you do need to do so, use cards with bullet points rather than sheaves of A4 that will invariably flap in the wind and distract the students. 5. Ask the taller students/staff to stand at the back of the group as otherwise shorter individuals will have their views of you impeded. Also, avoid students standing too far to the side of you or, even worse, behind you. They are an unwelcome distraction. 6. Colleagues can also unwittingly be a distraction. This is frustrating and can be difficult to handle, particularly if the colleague is older or senior to you. I normally try to have a quick word and ask for their help, e.g. “Please could you stand behind student X to ensure he doesn’t distract the others? Thanks.” It normally does the trick. All students must be able to hear you clearly. Again, this does seem obvious. However, if a few basic principles are forgotten, a fascinating talk being given outside will be heard by no-one. A friend working with a group on Chesil beach in March experienced wind flurries and temperatures of -5º. The only way he could communicate with the students was by getting everyone to lie down in the shelter of a big berm! 7. Speak clearly and modify your language if you are speaking to students with learning difficulties or for non-native English speakers. 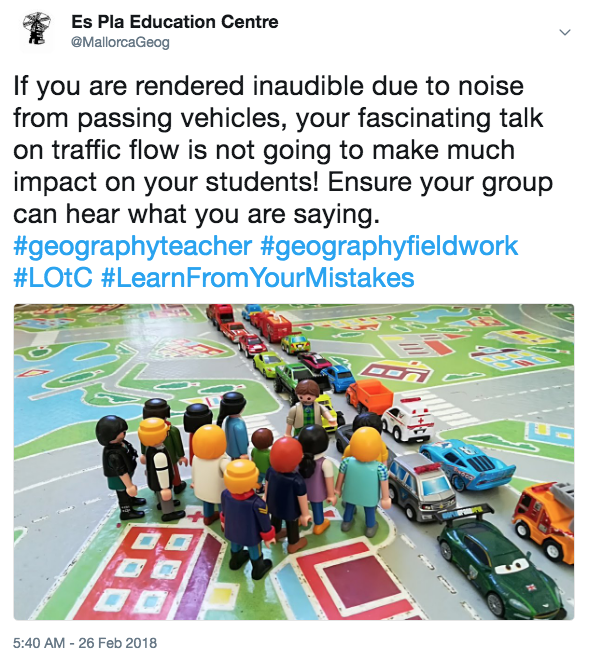 I once observed a colleague giving a talk about urban planning while standing with a group next to a busy motorway. The students did not hear a word of what he was saying. My colleague was so enthusiastic about his subject that he had forgotten to consider that the environment was rendering him totally inaudible! Another colleague gave a talk about beach processes in gale force winds. Again, despite shouting, he was unable to be heard. Hunger and thirst can cause students to lose focus. Of the five senses, the issue of smell is one that is perhaps least considered by those who teach outdoors (and indoors, for that matter). However, it can impact severely on learning outcomes for groups. First is the thorny subject of personal hygiene. In warmer climates, it is crucial that you wear clean clothes and use ample amounts of deodorant. In addition, brush your teeth and carry a packet of mints in order to avoid halitosis. 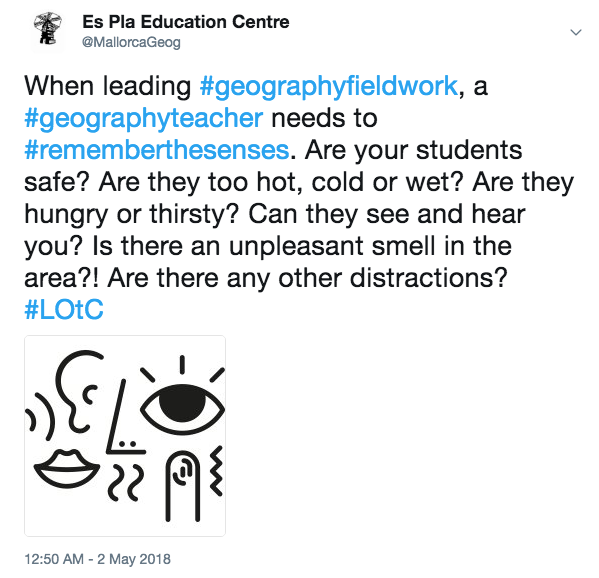 Not doing so will mean that when interacting with your students they will be more concerned about how to escape the odour you are exuding rather than focusing on what you are saying. Most people, if you ask them, will recall a teacher from school that had a certain smell or particularly bad breath. Mentioning this to an individual colleague is tricky so what I done on various occasions is to collectively remind groups I have worked with in a matter-of-fact manner. This avoids an awkward and potentially embarrassing one-to-one conversation. However, sometimes a more direct approach is necessary. 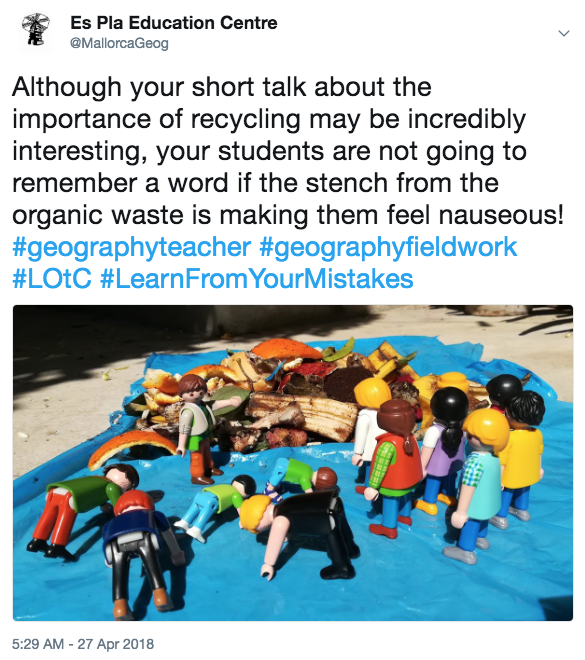 On one occasion, I was working with a group of international students and was receiving a lot of complaints, particularly from some of the female pupils, about a particularly malodorous student who we shall refer to as John. In order to be sensitive and to try to avoid embarrassing him I decided to speak to all of the male students together. I told them that there had been some complaints about our (crucial word) levels of personal hygiene and proceeded to list everything we (crucial word) needed to do each day – shower, deodorant, clean clothes, mints etc. My pep talk was resoundingly unsuccessful and the complaints from John’s group continued unabated. Step two involved sending a Whatsapp message to all the male students reminding them of what I had said and politely requesting their help in resolving the problem. Again, this was spectacularly unsuccessful! In desperation I called another meeting and this time proceeded to spell out the problem a little more graphically. There had been complaints, our lack of personal hygiene was provoking unhappiness etc. Half way through my speech one of the more confident students, who had clearly had enough, shouted out, “John, he’s talking about you!” I quickly intervened and denied I was singling out individuals. However, this intervention did seem to do the trick and there were no subsequent complaints about smelly John! In order to learn, students must feel as little discomfort as possible. Ironically, I once fell in a river while undertaking a fieldwork risk assessment! I headed back to the office to dry off. However, before I could do so, my then line manager bizarrely decided that this was the perfect moment to give me some C.P.D. (or in this case, pointing out my faults!) By the time he had finished, I was shivering violently and suffering from mild hypothermia! I certainly wasn’t paying any attention to what he was saying. A hike in a national park in Spain with some fashion conscious teenage girls from Italy turned into a nightmare when they categorically refused to find a tree and a leaf. They had been warned about the lack of traditional bathroom facilities but unfortunately had not heeded this warning. The walking pace slowed considerably due to the conflict between their physiological needs and their demands for white porcelain. 4. Including some tissues, wet wipes and hand cleaning gel in a first aid kit is always a good idea. The attention of some students is affected if they are dirty. I (and Ricardo!) hope that this short article will prove beneficial to you, your colleagues and your students.